press V, it goes to freehand session mode, then press B for box selection, the object name at the upper left of the viewport becomes white as if the object gets deselected. draw a stroke, the layer gets clean. The blend file has 3 monkeys with the same issue. Really, I don't understand the problem. One side note, the Box selector in Draw mode works as a Eraser...all strokes selected are removed. This is only in Draw Mode. 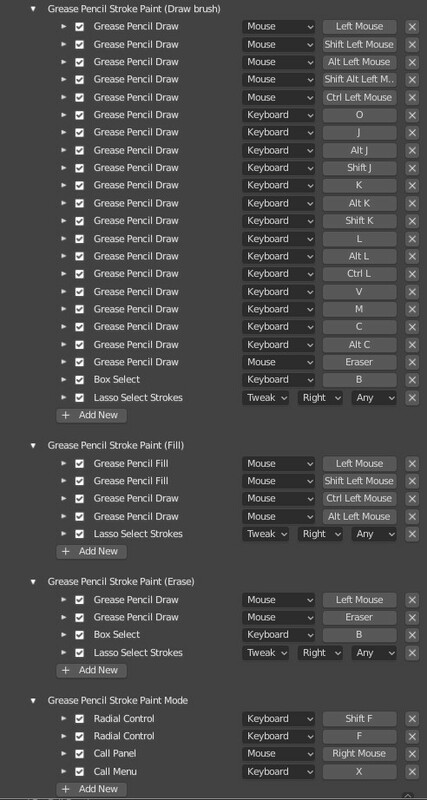 @iszotic (iszotic) Could you verify in grease pencil dopesheet how many frames you have? 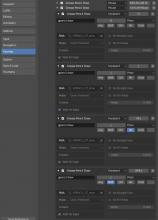 not sure if you are creating a new keyframe and this is why the layer is empty. Antonio Vazquez (antoniov) added a subscriber: Charlie Jolly (charlie). @Charlie Jolly (charlie) You added the V key. Could you review why and what is going on here. Review these keymaps. I have fixed the operator for adding new datablock. This operator must be used only in OBJECT mode. 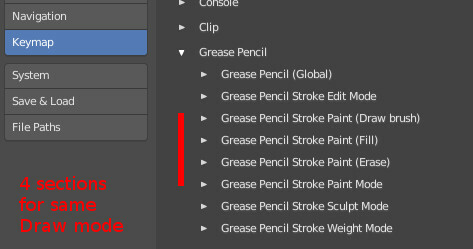 It looks like keymap of Grease Pencil is not reliable at all. There are 4 sections corresponding to draw mode (Draw brush, Fill, Eraser, Global Paint). They are at same level than other modes but they should be sub-section of one draw mode. There should be a global section of draw mode to call different active tools. Currently, user can press a key that is supposed to be a modal key of an active tool while using another active tool. @ronan ducluzeau (zeauro) I don't know how is now because I did not made the conversion of the keymaps to new python format, but when this was in C code, there was a poll method to disable/enable keymaps depending of the brush, so, for example, you could not use a Fill keymap with a Draw brush selected. There are 4 keymaps relative to active tools. But that is not obvious, there is a hierarchy between them. 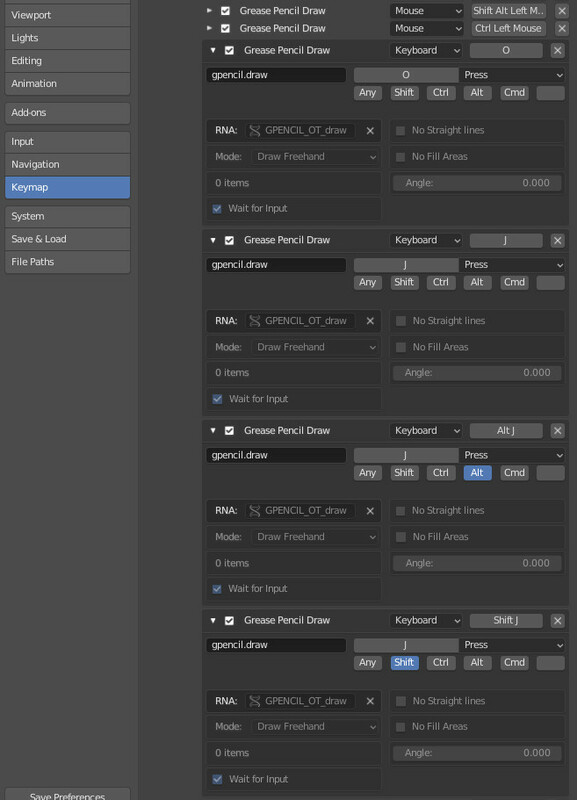 There is no Draw mode (global) keymap. Operators are repeated in several tool keymaps. But that is useless. A shortcut like B is used by 3D View (global ) keymap, you will define a box although that has no effect whatever grease pencil tool is active. And if at the end, if Box Select does not select anything but reacts as cutter tool ; why re-using box select name and panel ? But the worst is that same panel is re-used for almost everything. How user is supposed to understand that O is used for replacing origin of guides ? to what feature corresponds J,K,L,V,M,C ? Such panel makes sense for annotation. But all little options of the mode needs to be identifiable by a proper panel. The B for box selection is the same key, but the operator is not the same. Anyway, as I told you, I did not convert this to python, so not sure how works now the keymaps, maybe it's possible to merge in one group. @Campbell Barton (campbellbarton) What do you think here? L is shortcut for parallel line guide. C is shortcut for circular guide. J & K rotate the line guide. These could be removed and replaced with a plugin if they are causing problems.